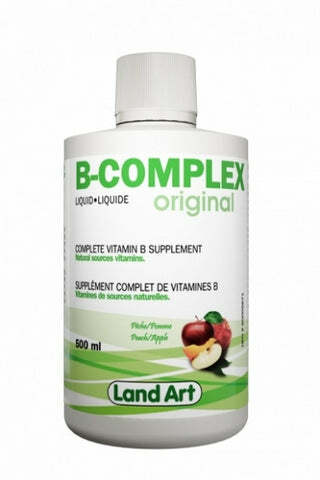 Land art B-complex contains the Group B vitamins that are essential for keeping a good health. B-Complex Zen formula provides all the benefits of a balanced B vitamins complex, but contains ingredients known to help relieve nervousness. Purified water, concentrated apple juice, xanthan gum, natural flavor, sodium benzoate, potassium sorbate. *Contains no dairy, wheat, gluten, yeast or corn. Helps to balance the nervous system. Helps the body to metabolize nutrients like fats, carbohydrates and proteins. Helps to improve the mental and physical performance. Children (1 to 8 years old) 1 teaspoon (5ml) daily. Adolescent (9 to 18 years old) 2 teaspoons (10 ml) daily. Adult: 1 tablespoon (15 ml) daily. Do not use if you suffer high blood pressure. Consult a health care practitioner prior to use if you have any type of acute infection, if you are pregnant or breastfeeding or if symptoms persist or worsen. Stronger or irregular heart rate and rhythms can occur. If it is the case, consult a health care practitionner. Consult a health care practitioner prior to use if you have depression and/or related diseases, if you are pregnant or breastfeeding or if symptoms persist or worsen. Founded in 1992, the family business Land Art has quickly become a leader in the field of liquid dietary supplements. Our unique, multidisciplinary team develops and produces its own products, which are then distributed across Canada. Our team share the same passion, to offer effective and excellent quality dietary supplements. With more than 50 products on the market, Land Art distinguishes itself by the great variety of its supplements, which fulfill ever growing specific needs. We continue, thanks to research and development, to innovate so we can create and offer liquid products that meet demand and correspond to the expectations of the population. We have dedicated and highly qualified employees who can answer any questions users may have concerning product use or their composition. Biochemists, microbiologists, flavorists, food science specialists and naturopaths are available to guide you. Because of its multidisciplinary scientific team and its expert-laboratory, Land Art elaborates and develops all its products according to an approach that is scientific as well as naturopathic. This mixed approach ensures the optimal development of its products. Bottled in our Health Canada (license number 300423) certified 37,000 sq. ft. plant, our products are subjected to strict quality control. All its raw materials, packaging and finished products are controlled and supervised by a completely computerized production tracking system. To ensure quality, each batch is analyzed by an independent laboratory before it is put on the market.